Extract: "A .IMMOBILIEN web address is more than just a URL: it’s good business. Industry professionals appreciate the authority and instant identification the name portends. This increased brand recognition helps increase site traffic and generate greater revenue". Extract: "Today, Paul Stahura, Founder and CEO of Donuts Inc., published a follow-up article on CircleID called “The Empire Strikes Back: “New” Verisign Hums a Familiar Tune.” In the article that rebutted McPherson’s article, Stahura discussed why he believes Verisign is worried about the new gTLD domain names". 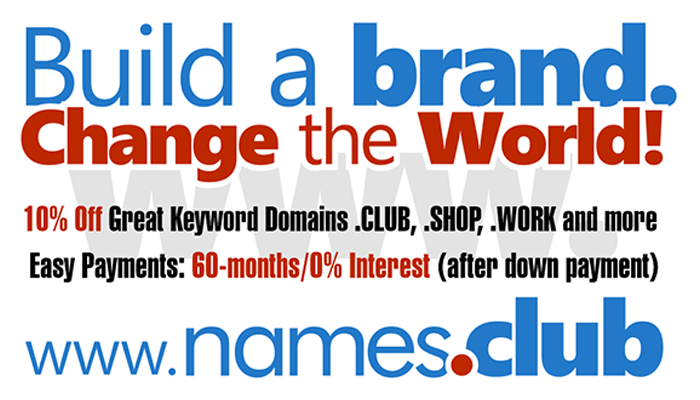 Extract: ".XYZ is an embarrassment to the domaining industry and specifically to the New gTLDs. We all know this, yet some choose to ignore the facts and still quote all the .XYZ registration lies while others have attacked it. I found that 106 .xyz domains that are in the Alexa top 100,000 have fake and inflated rankings because of some kind of manipulation". Extract: "Frank Schilling comes on the show this week to discuss why he decided to shift his lifestyle from a relaxing one of managing his own domain name portfolio to starting a number of domain name services businesses. He also explains why he applied for new top level domain names and what impact he thinks they’ll have on his (and your) .com domain name portfolio". Extract: "One of the most interesting topics to watch in 2015 will be the ongoing conversation between Registrars and the new gTLD Registries on Premium name pricing models. Some new gTLD Registries are choosing to not use the classic simple and standard pricing model (with a standardized first time and renewal fee by TLD - in other words the classic .com model). In talking to many Registrar partners I’ve heard clear frustrations because they are finding it hard to keep all the different Registry pricing models straight while figuring out the best way to convey the various pricing structures to their customers. This is complicated by the fact that targeted revenues from the new gTLDs registrations are not coming in, so some Registrars are wondering why they should bother building functionality for something that doesn’t yet contribute that much revenue. At the same time, it’s interesting to see quite a few Registries actually trying something new with a number of large Registries deviating substantially from a standard process. This is resulting in enough pressure on the Registrar market to adopt some of these new models. But it’s still too early to tell if any of the new models will be successful enough to remain in place". Extract: "Along with the upcoming rollout of sites specific to hundreds more top travel destinations, such as New York, Beijing, Sydney, Toronto, Madrid, Istanbul, The Caribbean, Rio de Janeiro, and more, partner websites operated by the One Degree World e-commerce solution can orchestrate reservations for...". Extract: "Storing sensitive data and archives on a separate .data domain is also beneficial in terms of security. After all, all of a company's data require special protection. With a separate .data domain, you can store sensitive databases under a separate URL with new storage concepts and modern hardware. The new .data domain also helps provide a better overview in terms of internal organisation: easily save data for your employees under the new domain and separate internal company traffic from the external hits from your visitors". Extract: "During the “landrush phase”, over 1,000 .NYC domain names had more than one interested party and were thus headed to auction. Ten domain names, according registry records, sold for more than $10,000". Name Collision domain names: is there opportunity for domainers? Extract: "The release of blocked second level strings is good for the domain name industry. Is there opportunity for domainers to profit from it". Les domainers, arbitres du jeu? Gouvernance de l’Internet : encore raté pour l’UIT.